It is difficult to keep up with the many graduates of the Calvin History Department. But there is one who merits special mention now. Dr. Rachel Koopmans was a top-notch student in the late 80s and early 90s. She took part in the inaugural of the “Semester in Britain” program, which I was pleased to begin in 1989. After Calvin, Rachel went on for PhD studies at Notre Dame University, where her supervisor was John Van Engen (another of our grads, though about twenty years earlier). She taught in the History Department at Arizona State University for five years, and she has been well-settled since 2006 at York University in Toronto. This is a belated congratulatory notice about a considerable achievement by Dr. Koopmans. In 2012 she was awarded the Margaret Wade Labarge Prize for the best book in medieval studies. 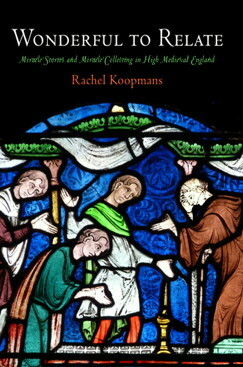 The book is: Wonderful to Relate: Miracle Stories and Miracle Collecting in High Medieval England (Philadelphia: University of Pennsylvania Press, 2011). It is about how church people in medieval England collected and preserved stories about miracles in their time. The award says the book “is written in an exceptionally graceful style,” (no surprise to Calvin faculty who read her student essays). Ronald A. Wells is professor of history emeritus. He is the author of History Through the Eyes of Faith and other books. He was an editor of Fides et Historia and of The Reformed Journal. With James D. Bratt he is co-editor of the book, The Best of the Reformed Journal. He is now mostly retired and lives in the foothills of the Smoky Mountains in Tennessee. This entry was posted in Ron Wells and tagged Calvin College, Margaret Wade Labarge Prize, medieval studies, new books, Rachel Koopmans, Wonderful to Relate. Bookmark the permalink.